I'm changing it up again this week for Feel Grateful Friday! Not only do little reminders of positivity help us feel grateful, but mediation is one of the most powerful tools to help us on our gratitude journey. Merriam-Webster's simple definition of meditation is: to spend time in quiet thought for religious purposes or relaxation. I'm seriously amused that there is a simple definition at all, even though the concept itself is just that. Seriously, though, have you ever tried meditating? In this mile-a-minute world we live in where everything is instant and our minds are constantly racing on to what's happening next today, tomorrow, in a week, or next year, it's hard to actually focus on what's happening right now. Literally, as I sit here typing these words I'm listening to the tv in the background, the guy mowing his lawn outside and thinking of what other items I need to check off my list today. It's a constant battle to focus on what's happening in each second as it's happening. As I've delved deeper into my meditation practice I find I can be more appreciative of things as they are happening and really live in the moment. Which is what life really should be all about. Today I'm giving you some tips that have helped me along the way. Start small: Literally start really, really small. When I started meditation initially, I started playing positive meditations in the background as I did my makeup in the mornings. As the weeks went on, I noticed I'd stop more often to focus on specific things that were being said. Without forcing myself to concentrate I was inadvertently concentrating, so I knew I was ready to fully focus on the practice. Taking the plunge: I then started setting aside 10 mins of quiet time and picked one phrase to focus on such as, "Today, I will be more present." I noticed at first the quiet wanted to be replaced by other thoughts, such as, "I need to get going, I need to get ready, I've got a lot to do." However, I pushed those thoughts aside and as I focused more and more on my breathing and the phrase at hand, "Today, I will be more present," I found over time I was able to really focus. Increasing the time: I started doing the practice for longer amounts of time, slowly increasing until I was 100% concentrated for the time I was taking. I suggest also splitting times. Right now I'm up to 2 30 minute meditation sessions, one first thing in the morning and one right before bed. While that doesn't sound like much, imagine sitting for 30 minutes 2 times a day really focusing on the present moment. It blows my mind to think about it, yet here I am. Stick with it: Meditation sounds easy enough, but it's one of the hardest things I've ever done in my life. If you think you can't stick to a workout, try meditating. It's so easy just to count it as a loss and move on with your busy day, but I promise you, as you start to notice a positive change in your life you'll feel more committed, and unlike working out, those changes happen almost immediately. Even focusing for 5 minutes to start my day made me more aware of everything happening and I was able to have a more positive outlook and really enjoyed the small things every day. Stick with it, I promise you won't be disappointed! I've tried it before and I want to make it a part of my weekly regimen!! I'm thinking of getting an app and meditating every day!! 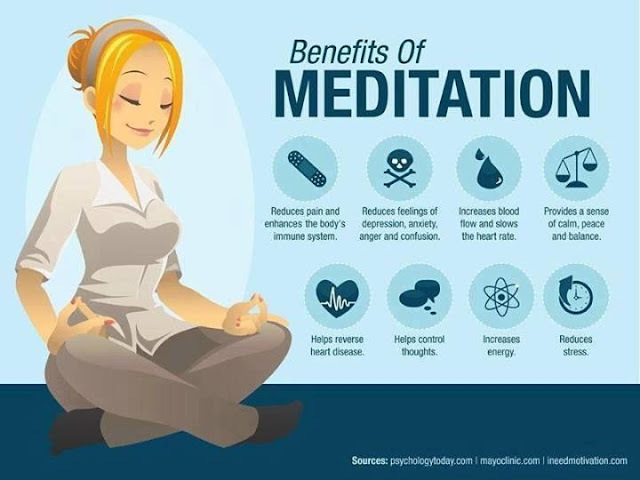 I've never tried meditation, but I totally get how it would relive stress. I did a lot of yoga, which I guess could be considered to be similar to meditation, in college. Ironically, I wasn't very stressed in college, so it would probably be more beneficial to try it again now! Thanks for sharing your tips and suggestions for integrating meditation into your daily routine Kim, I would love to give it a try!